Haha I love your imagination..really!!!!!!!! u dont come on my space that often .. to kya baat alag hai ? hahahaha…this one is gr8. laughing freely now. This should hit the national newspapers. I am glad you followed the details 🙂 Thanks ! this is perfect!! loved it…good one as usual..
That cartoon’s killin’ me man! 😀 Stay Safe Brendan ! A good presentation of the current situation of our finance minister. I doubt he has any way out of this. Kyu PC ka koi dollar mai income hai kya? :P…..Face mast hai..lol..PICTURE PERFECT! Girte rupee pe hansna mushkil hai but you somehow manage to make me do that! Unke kya farq padta hai. Unke liye toh vaise bhi sab kuch subsidized hai :). so true !! no need to worry bolke hogaya .. petrol to hume bharna hai .. sabziyan hum kharidenge .. why should we not worry .. wish I could ask the gentleman claiming to be such a great finance guru .. ghar ke kharche ..nikalna mushkil hojata hai ..
High salaries and yet low standard of living !! Indian Middle class has been ruined within these 10 years .. all the more .. Exactly. The shameless lot has subsidized food in parliamentary canteen, lal batti cars, unlimited budget for foreign jaunts, and all kinds of subsidy besides lot of black money. What do we have — thenga! good one, how will he know what is the plight of common people…. u tried Bengali ?? Good attempt 😀 Thanks you so very much for going that extra mile brother 🙂 overwhelmed !! 5, Chandni Chowk Steet !! Chinese neighbours all around right ? Yes, Mysay .. Those where special memories ..living in Kolkata … i miss it badly .. besides i am happy to know that you are from kolkata .. which instantly connects me to you! ki sundara jāẏagā …uff !! narama udāra ēbaṁ narama kathya mānuṣa ..
Ho ho ho Ho. I like the element of a stone attached to his leg chidu’s leg. Its quite a good one! Thoroughly enjoyed it. But then he is only doing his job, if he says get worried, there would be bloodpath in the stock market, our economy will nose dive. hahahaha… so true but .. as the FM of the country he should have noticed such situation never arise .. Yet its happening .. The way things are going it is getting scarier. Great work with the toon. We have tied the deadweight around our necks. 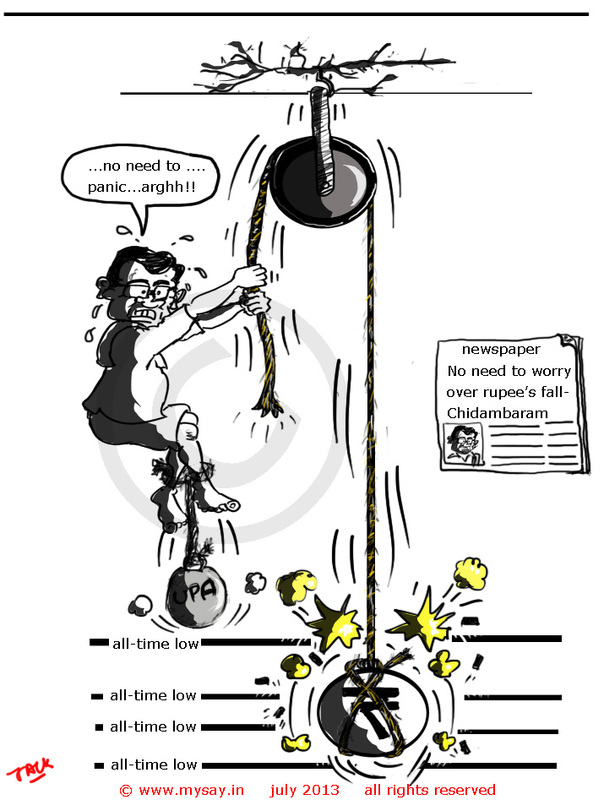 Hope we survive till the next elections…. the government seems very keen on disposing us all off to ensure they stay on! Great sense of presentation! And well said in a comment. High salaries and low standard of living. So true! I am officially a fan of your cartoons now! Each post is so brilliant that it always strikes the right chord! thanks a ton Isha ! your praises are a motivator forsure. Waiting for Manmohan Singh to condemn the Rupee. 😀 you sure know how to get the ribs cracking! I am still shocked that exchange rate is at 60!!! To comment on your cartoon is to have the opportunity to be familiar with the unmistakable genius of your art. A Great one indeed!